Background: Dexketoprofen is the pharmacologically active enantiomer ofracemic Ketoprofen, and is indicated for the treatment of acute pain. Objective: To record the efficacy and safety of Dexketoprofen 25 mg Tablet in treatment of acute dental pain. Material and Methods: This was an observational, prescription event monitoring study in clinical setting. Indian male or female patients between 18-65 years of age who would be undergoing oral surgery consisting of extraction of the impacted or semi-impacted third molars or have acute dental pain and willing to comply with study were included. Patients were treated with Dexketoprofen Tablet 25 mg (Infen-25) every 8 hours preferably 30 min before meal. Efficacy was analyzed by decrease in pain on VAS (Visual Analogue Scale) and investigator's overall assessment of efficacy of therapy. Adverse events, if any, were noted. Results: Data of 3318 patients were analyzed. Mean baseline pain intensity on VAS decreased from 7.74 to 7.02, 5.48, 4 22, 3.31 and 2.52 at 10, 20, 30, 45 and 60 minutes, respectively, after drug administration. Investigators' overall assessment for efficacy was good to excellent in 96.5% patients, while investigators'Dexketoprofen was very well tolerated. Conclusion: Dexketoprofen Tablet provided rapid onset of action, with good tolerability and very high patient and investigator satisfaction. Ketoprofen is a racemic NSAID containing 50:50 mixture of S (+) and R (-)-enantiomers. S (+) enantiomer of ketoprofen, i.e. Dexketoprofen, retains all NSAID properties of Ketoprofen, while the R (-) enantiomer does not posses any NSAID property. "Racemic switch" i.e. replacing racemic drugs with chirally pure form to achieve better therapeutic index is recent trend in clinical practice  . Many published studies have supported the role of Dexketoprofen in dental pain, postoperative pain, musculoskeletal pain, dysmenorrhea, cancer pain and acute low back pain. Mark McGurk et al 1998, compared the efficacy and tolerability of single doses of Dexketoprofen trometamol and Ketoprofen through a double-blind, randomized, placebo-controlled study in 210 patients with moderate to severe pain after removal of one mandibular impacted third molar tooth. They concluded that Dexketoprofen (as trometamol) 25 mg was at least as effective as the racemic Ketoprofen 50mg in the treatment of post surgical dental pain  . Balani M et al 2008, compared therapeutic efficacy and safety of Dexketoprofen 25 mg with Ketoprofen 50 mg in Indian patients undergoing dental surgery, and they concluded that Dexketoprofen (25mg) was a fast and equally safe therapy in the treatment of acute pain of dental surgery  . Normally, the pain after oral surgery is considered as moderately intense and NSAIDs have been the drugs of choice in the treatment of dental pain. Their analgesic and anti-inflammatory properties are attributed to the inhibition of the COX pathway (COX-1 and COX-2). The ideal analgesic however should fulfill the following conditions: elevated analgesic potency, fast action, long-lasting analgesic effect, without risk of addiction, high tolerability, low risk of adverse reactions and comfortable to administer  . This was an observational, prescription event monitoring study called the RAPIDD (RApid Pain relief In Dental pain with Dexketoprofen) Study. Indian male or female patients, between 18-65 years of age, who would be undergoing oral surgery consisting of extraction of the impacted or semi-impacted third molars or have acute dental pain and willing to comply with study were included. Patients with hypersensitivity and/or contraindications to Ketoprofen and/or any other NSAIDs, pediatric patients, pregnant and lactating women, patients with a history of peptic ulcers, patients who will require other NSAIDs/narcotic analgesics other than study medication, patients with impaired hepatic and/or renal function and patients who were deemed unsuitable by the investigator, were excluded. Study treatment was one Dexketoprofen (as Trometamol) 25 mg Tablet (Infen-25) every 8 hours administered orally preferably 30 minutes before a meal. Patient demographics, dose, regimen, adverse events, and investigator's opinion on efficacy and safety were recorded. The data was collected and results analyzed centrally by a medically qualified personnel independent of the participating doctors. Efficacy variables were decrease in pain on visual analogue scale (VAS) and investigators' overall assessment of efficacy of therapy. The adverse events were categorized according to severity and percentage of each adverse event was calculated. Data of 3318 patients were analyzed. Demographic details are presented in [Table 1]. As shown in [Table 2], there was statistically significant decrease in pain intensity on VA S from as early as 10 minutes after taking the medication. As per the investigator's overall assessment, efficacy was excellent in 30.55 % of patients and good in 65.95 % patients. Hence efficacy was good to excellent in 96.50 % patients [Table 3]. Commonest side effect of Dexketoprofen 25 mg Tablet observed during the study was gastric disturbances (3.21%) and other side effects included nausea (0.48 %), headache (0.12 %), and pruritus (0.03 %). Majority of adverse event noted were mild in nature. Many reported studies assessed therapeutic efficacy of Dexketoprofen in dental pain, postoperative pain, musculoskeletal pain, dysmenorrhea, cancer pain and acute low back pain. Dexketoprofen used in this study was in the form of its trometamol salt. Dexketoprofen is a lipophilic drug; however the trometamol salt renders it highly water soluble. Hence Dexketoprofen trometamol has rapid dissolution in gut. Dexketoprofen trometamol is over 100 fold more water soluble than the free acid form. These properties lead to rapid and more complete absorption in gastrointestinal tract leading to minimal exposure of drug to gut lumen and less gastrointestinal toxicity  . Dexketoprofen trometamol is available in European market since long time; recently it has been made available in Indian market as oral formulation of 25 mg.
Jimιnez-Martνnez E el al studied of the analgesic efficacy of Dexketoprofen 25mg. vs. Ibuprofen 600 mg after their administration in patients subjected to oral surgery. They demonstrated the greater analgesic efficacy of Dexketoprofen in the first hour after the oral surgical intervention and its greater anti-inflammatory effect  . The results of this observational study are similar to previously reported studies. The baseline pain intensity on VAS scale decreased from 7.74 to 7.02 within a span of 10 min (P < 0.0001). This highlights the rapid onset of action of Dexketoprofen trometamol. The pain intensity on VAS scale decreased consistently at 20, 30, 45 minutes and at 1 hour after administration of drug (all values are statistically significant P < 0.0001). 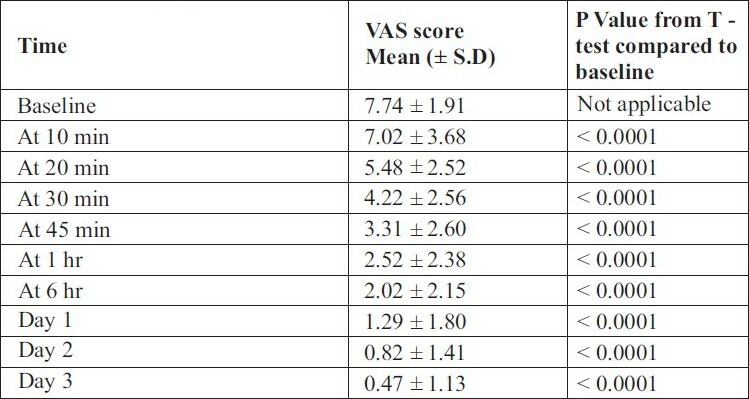 On day 2 and day 3 pain intensity on VAS scale was negligible (0.82 and 0.47 respectively). According to investigators' overall assessment efficacy was good to excellent in 96.5% patients and tolerability was good to excellent in 97.8% patients. Hence dexketoprofen was very well tolerated in most of the patients and majority of adverse events were of mild in nature. This observational, prescription event monitoring study in clinical setting confirms that Dexketoprofen has rapid onset of action with good tolerability and very high patient and investigator satisfaction. 4. Jiménez-Martínez E, Gasco-García C, Arrieta-Blanco JJ, Gomez del Torno J, Bartolome Villar B.Study of the analgesic efficacy of Dexketoprofen Trometamol 25mg. vs. Ibuprofen 600mg. after their administration in patients subjected to oral surgery. Med Oral. 2004; 9(2):143-8, 138-43.